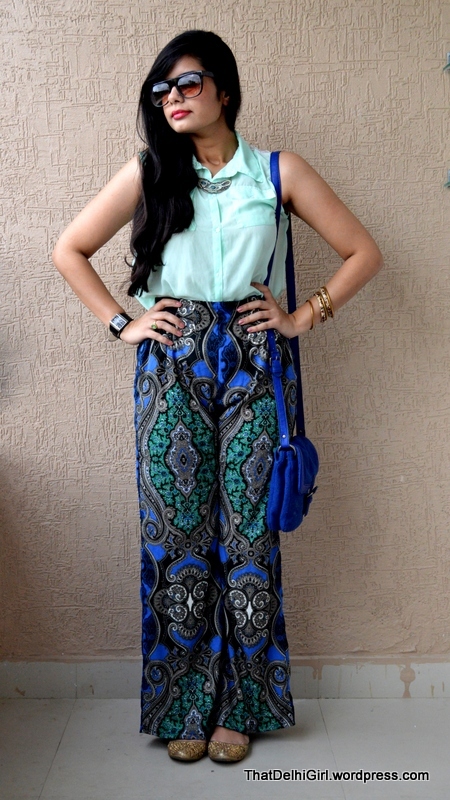 Palazzo pants have been a big trend for quite a while and why not ?! The wide-legged pants are airy, makes your skin breathe, super comfortable and yet trendy. 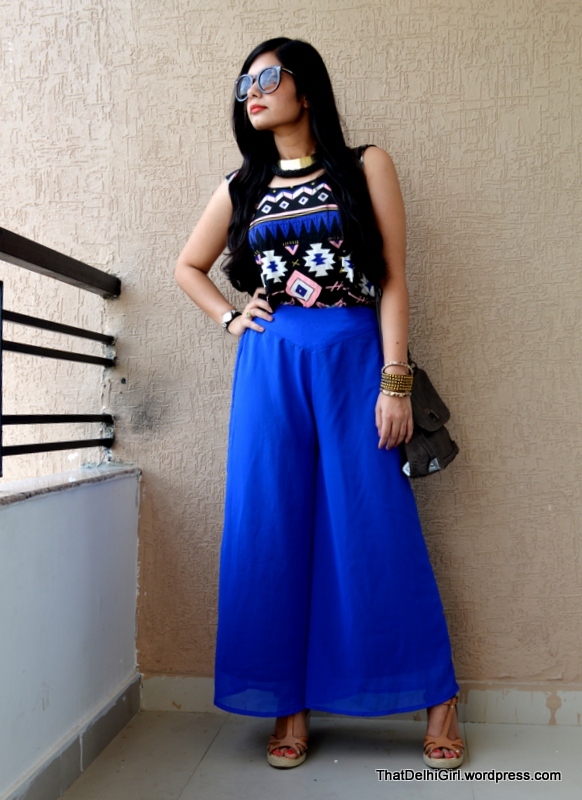 I had been doing random Instagram posts wearing my Palazzo pants and as per the comments I would recieve from some of my followers I could sense a little reluctance among girls as to how to wear the Palazzo pants right. Thus here this post is an attempt to break the inhibition as faced by many. 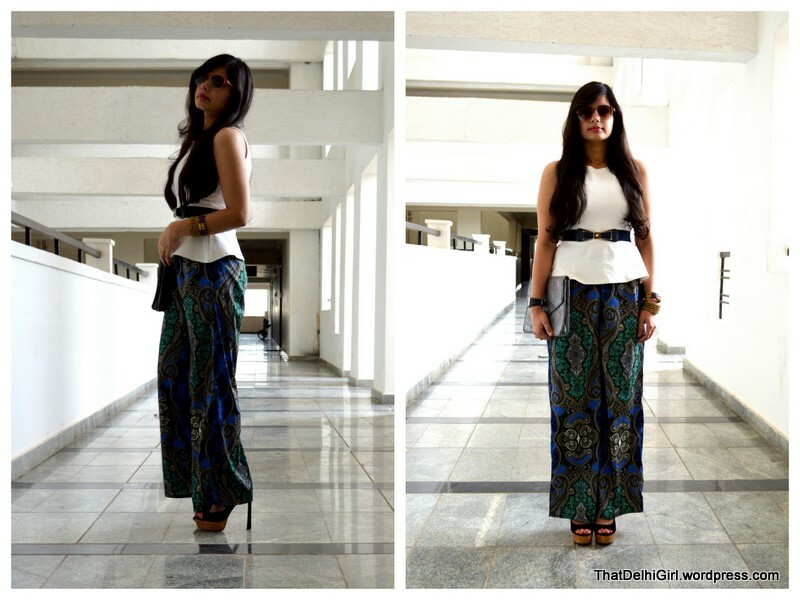 I have come up with seven different ways to style Palazzo pants in this post. I’ll call this the vacation-mode-on-look ! For any regular day at college. Going out for an office dinner, this might help you break the stereotype. For a little trip to the mall ! 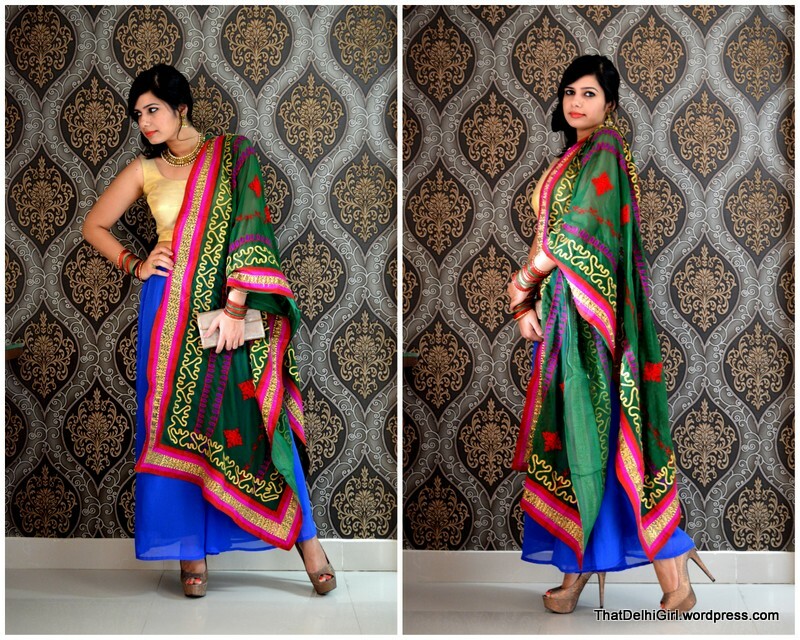 For a glam-evening with your girls, give your regular one-piece dresses a break and try this ! As they say, last but not the least. This is my favourite look. The desi-avatar of Palazzo pants, wear it when you don’t want to wear a Saree because you got to run & dance around a lot and wearing a Lehnga would be too extravagant. Pair plain Palazzo with a Choli & heavily embellished/embroidery dupatta and you’re all set to dance to the desi beats !! Hope this might loosen up some of you girls inhibitions to wear Palazzo pants and I’ll like to see you guys trying some of the ideas I posted here, feel free to share your views even pictures inspired by any of these looks via email/social media. 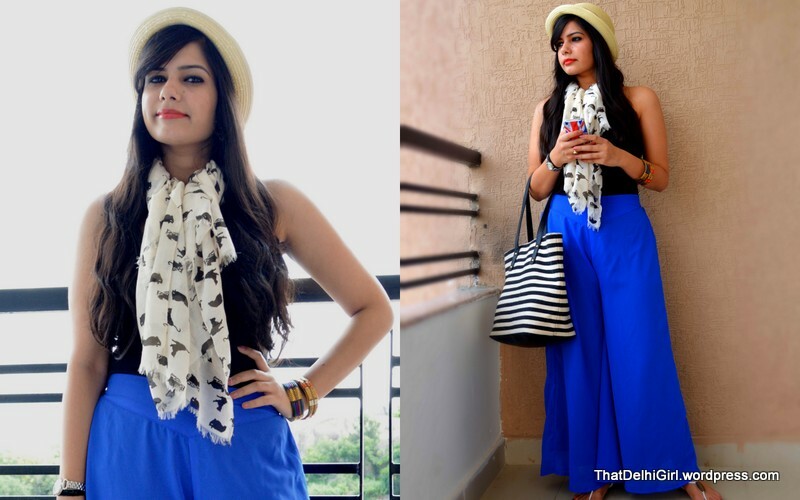 You can try online sites like koovs, fashion at click, jabong, etc or stores like AND.. I love how you’ve paired up the palazzos for each occasion pefectly. Just one thing I wanted help in is the right place to buy them from and to get the right length, I am 5′ 9″ .Looking forward to hear from you on this! Haha ! Am glad it changed your mind, you must have at least one for they are so comfortable ! Wow! 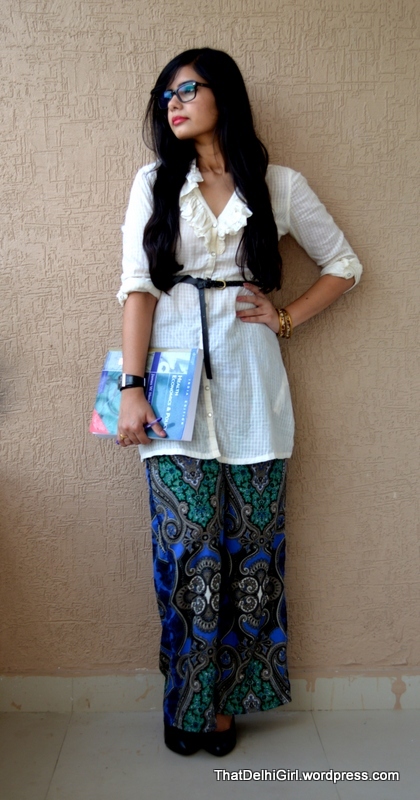 I was never sold on the palazzo pants because I thought they were too frumpy. This post totally changed my mind! Okies 🙂 Do you have some app for this Blogger site? Hey I really love the way you live.. I mean seriously you are a combination of beauty with brains.. I’m a South Indian girl 19 n wud really want to learn things from you… you’ve actually influenced me.. I noe it won’t be possible for you to give me your number n ol… so here’s mine… check me on WhatsApp n Instagram if you want n den plz text me… my number is +919096999172.. ciao! Tc..
P.s. I’m not gay 😛 🙂 I’m just a bit (a lot) desperate to seek your advice n stuff.. u noe wot I mean the girlie part.. I don’t know your name but I found your account on Instagram n then I started following your blog here on wordpress. I really enjoy reading your post. Good work girly keep it up. Will be looking forward for more updates. Have a nice day too ! love all the styles, but my fav is also the desi one! I myself am just 5.2′ which I don’t think is tall either, it’s just how you carry it. Yes of course, in the post itself I have worn them with flats too, you can wear palazzos with cute tees/ ganjis & crop tops with flats ! Thank you & you must buy one soon ! Will palazzos look good on flats or ballerinas? as am scared scared of wearing these long heels. After this post especially the desi avtar and the first one I am buying palazzos^_^. That’s great, you must ! Will be definitely trying palazzos now.